Originally published in 1898 as To-Morrow: A peaceful path to reform, "the book", writes F.J. Osborn "holds a unique place in town planning literature, is cited in all planning bibliographies, stands on the shelves of the more important libraries, and is alluded to in most books on planning; yet most of the popular writers on planning do not seem to have read it - or if they have read it, to remember what it says." The book led directly to two experiments in town-founding that by imitation, and imitation of imitation, have had a profound influence on practical urban development throughout the world. The book was responsible for the introduction of the term Garden City in numbers of languages - Cite-Jardin, Gartenstadt, Ciudad-jardin, Tuinstad - and set into motion ideas that have helped transform the scientific and political outlook on town structure and town growth. 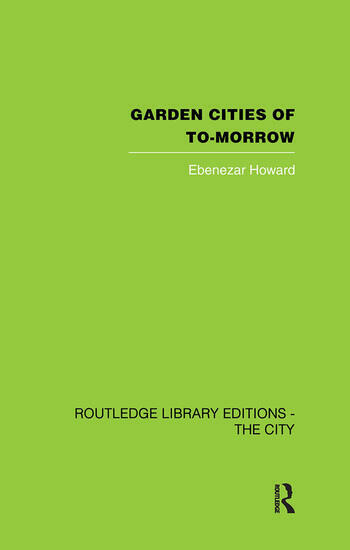 With urban renewal and the development of suburban communities as features of the contemoprary American scene, Garden cities of To-Morrow becomes "must" reading. In the words of Lewis Mumford: "This is not merely a book for Technicians: above all it is a book for citizens, for the people whose actively expressed needs, desires and interests should guide the planner and administrator at every turn." This book was first published in it's current form in 1965.